It will not help you to make time go hard. For example, the T65 consisted of its variants in 2015 for 50 years. Of course we have devoted attention to this museum. The T65 exhibition showed all the devices with the accompanying and documentation. This action is also the start for the redevelopment of our museum. The T65 was the standard phone set from the Netherlands from 1965 to 1988. Many Dutch households received their first telephone connection during this period. The T65 is therefore a well-known appearance. The device was developed by PTT in cooperation with the German company Krone. The technical section, which had to comply with Dutch PTT requirements (norm ’51), was designed by Rotterdam Professor H. Mol. At the bottom of the device are listed: “PTT type T65”, manufacturer name and production date. Initially, the T65 was delivered with or without earth test. Later, from the beginning of the seventies alone, only with earth test. The standard color of the T65 was gray, with gray cords and some cream colored parts. Years later, the devices were also available in black, green, orange, blue, red, white, and brown. Various artists have developed a special hood. And because people became increasingly curious about the interior of the device, devices with a transparent hood have also been placed on the market. The T65 has been exclusively available as a rental device Fl. 2.50 per month. The weight of the T65 was reduced by half with respect to older models. The device was fitted with a cavity on the back that served as a handle. Making it easy to move. It was possible to use two T65 devices in a twin circuit. In an incoming call, both devices ran simultaneously, but if one of the two devices was recorded, the other was excluded. It was impossible to eavesdrop or talk through the other device. Because of the huge number of devices, the T65 was made by several manufacturers, namely Krone-Heemaf, Ericsson and Standard Electric (later NSEM). In total there are about nine million of manufactured. At the end of the T65, the manufacturers transferred the dies to the PTT Central Workshop. This because the large number of variants led to small production numbers. The production and purchase of the T65 devices stopped around mid-1986. The introduction of the T88 on January 1, 1988 meant the final end of the T65, which proved to be one of the world’s finest phones! Used T65 devices were revised by the CWP for several years, but the spare parts were limited. The rising labor costs will also play a role. The T65 devices were of exceptionally high quality; No wonder, therefore, that many devices have passed through 30 to 40 years of intensive use. Indians Within our museum we have a section of “Communication” – what is communication and what does it do. 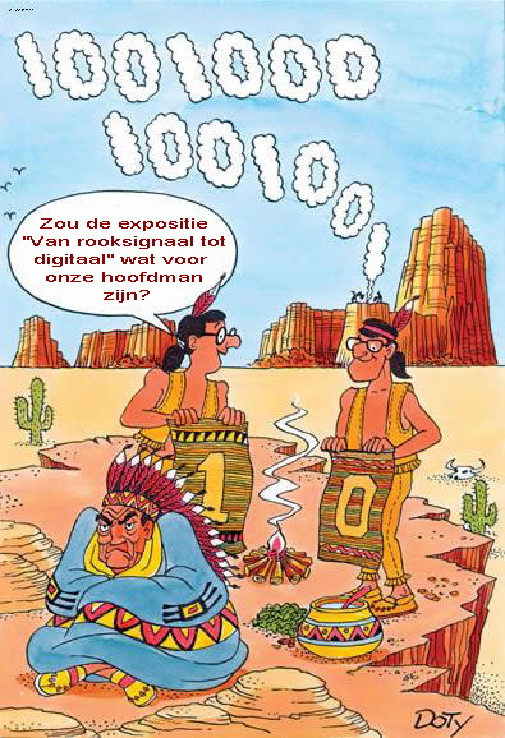 Part of it is “From smoke signal to digital”, which shows in a very understandable way how message traffic has evolved over the years. 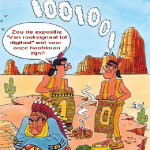 How did the Indians, our ancestors in the Golden Age communicate, or what is a fiber optic cable and how does GSM work? All questions answered in the current exhibition in the Houweling Telecommuseum. 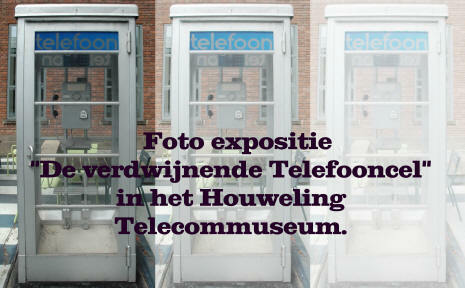 The Houweling Telecommuseum has the ‘walkway exhibition’ ‘The disappearing telephone box’. Seven students photography of the Graphic Lyceum Rotterdam have photographed the disappearing phone cell. The result is about thirty interesting photographs from very different angles. The exhibition can be visited on every Tuesday between 09.00 and 14.30 in the museum at 15 Vlaggemanstraat 15 in Rotterdam. A guided tour takes about 90 minutes. These pictures have been moved to the bunker, also reception rooms.